What if the Piwik main code is already implemented via Piwik template? When visitors convert a Goal, Piwik tries to attribute the conversion to the referrer that brought the visit to the site. Piwik will credit this Goal conversion to the last non empty referrer used by the visitor (ie. the last time the visitor came to the website with a referrer that was not a direct entry). But what if we want to know which source and medium was responsible for acquiring visitors who converted? We can easily tell Piwik to track the referrer which was first in a conversion process. To do this we just need to add one specific line to the main Piwik code. Let’s see how we can do this quickly via Piwik PRO Tag Manager. This modification requires you to manually alter the main Piwik code, not via a Piwik template. Why? Because this additional line of code has to be called BEFORE calling out with the trackPageView() method. Note: if you have implemented the Piwik integration with a tag template skip to the next chapter. And click on the name – in this case it’s Piwik Pro. To change the type of tag Click on the Asynchronous custom HTML tag. In the Tag HTML field we have to paste the Piwik Code. It can be found in the Piwik platform Administration panel (1) under Administration and Websites (2). Just find your website and click on the link called: View Tracking Code (3). From now on, Piwik will report the first referrer in all goal reports. 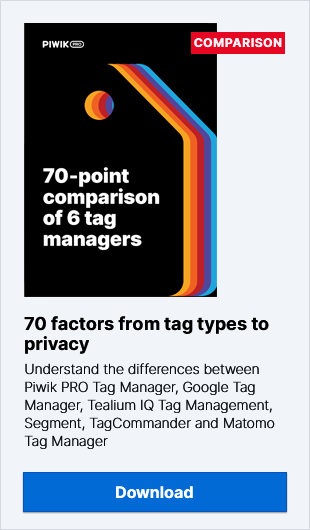 As you can see, these kinds of changes can be implemented quite quickly and easily when we are using the Piwik PRO Tag Manager. We don’t have to bother an IT team member extra tasks and wait ages for their response. So be sure to check out our Tag Manager User Guides to learn more.